Power supply HATs for the Raspberry Pi are nothing new and some may even question why we are reviewing a new version of the StromPi and not a PiJuice or Pi UPS + HAT? To answer that question, this review looks into what the latest version of the StromPi brings to the table and shows how we can use it. JOY-iT supplies the StromPi 3 board along with two spacers, two screws and two nuts. There is also a short instruction guide in German and English. The manual is very compact and caters more for the experienced Raspberry Pi user. Anyone who has ever plugged a HAT onto a Raspberry Pi should be able to install the board successfully with the help of the information included in this review. The StromPi 3 also supports the StromPi 3 Battery HAT, a 1000 mAh LiFePo4 battery with 3.2 V nominal voltage (3.2 Wh). 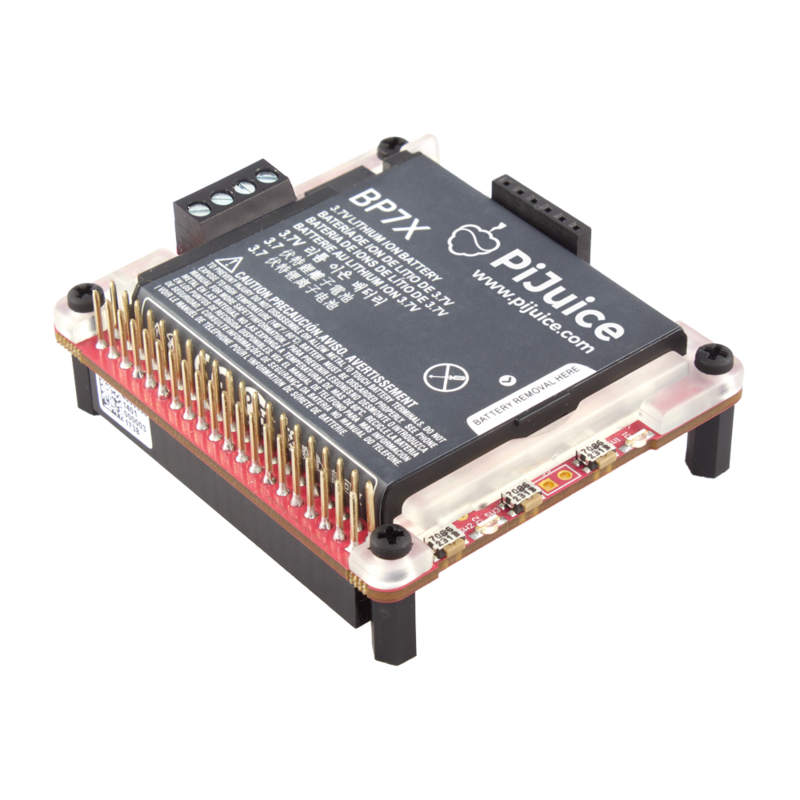 This HAT is simply plugged onto the StromPi 3 (in a disconnected state) and can then be configured to power the Raspberry Pi. In addition to the HAT itself the pack contains a brief guide to help assemble the board. The StromPi 3 provides a regulated 5 V power source to the RPi and draws its energy from one of three possible sources of input power. The first source of power is called the ‘wide-range voltage input’ which is a DC voltage in the range from 6 to 61 V and connects to the board via a 2-way screw terminal block. The second source of input power is via a USB port microUSB connector. 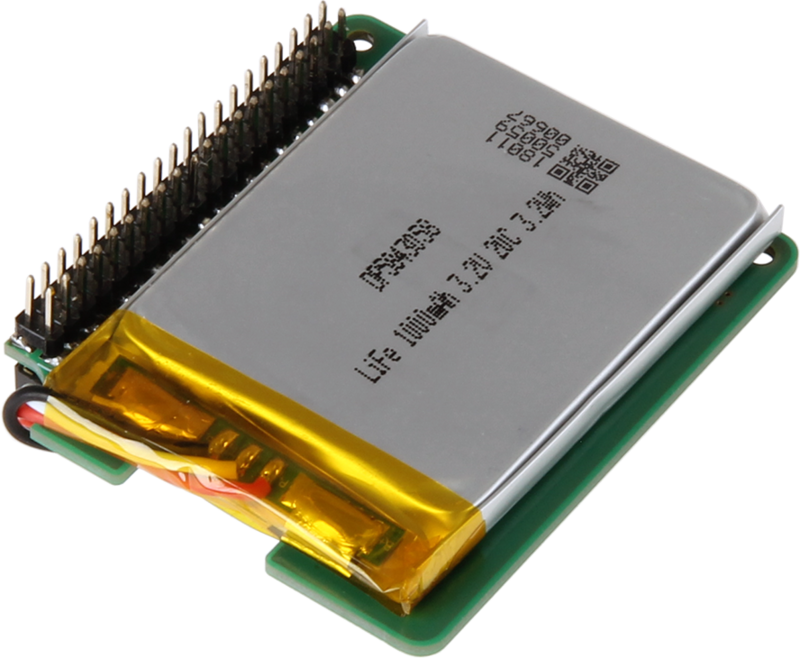 The third power input can be provided by a LiFePo4 1000 mAh battery which plugs flat on top of the StromPi 3 HAT. In addition to this, the StromPi 3 contains a built-in real time clock (RTC) module to allow the Pi to retain current time of day even during a power or network outage and also an STM32 microcontroller. This makes the StromPi 3 a handy add-on HAT if you want to supply up to 3 A for the RPi or any other 5 V development board from a standard 12, 24 or 48 VDC network. The STM32 microcontroller can be programmed to manage and switch between the pre-configured primary and secondary input power sources and perform programmable output power switching according to time of day. 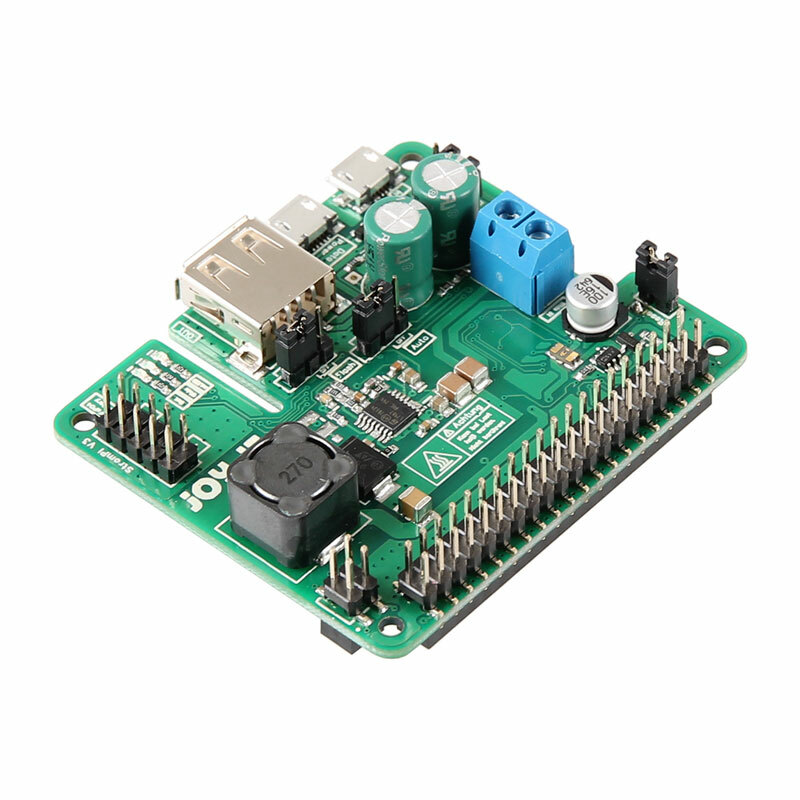 To support the use of more HATs the row of header connectors are pass-through type including the PoE connections on the RPi 3B+. The StromPi 3 provides a USB-A connector and two micro-USB sockets on the side. These can be used to supply peripherals such as hard drives which draw more than 500 mA. Although the StromPi 3 is intended for the Raspberry Pi, it can also be used with other SBCs that run on 5 V such as the BeagleBone Black, PCduino, Arduino and Red Pitaya etc. In this case, the USB-A port provides power to non-RPi boards.